Following a lull in the Middle East peace process caused by the 1976 presidential elections, President Carter entered office with a burst of new energy on the subject. Through direct personal appeal, Carter was able to bring ultimate resolution to the Yom Kippur War and completely change the dynamic of the Middle Eastern question. Israel and Egypt normalized relations and a framework for Middle East peace was agreed to. Years later, this would allow for the Oslo accord, and the Jordanian–Israeli Peace Agreement. Additionally, Carter also secured the complete realignment of Egypt. Once a Nasser led hotbed of anti-Western feeling, Egypt was to become one of America’s foremost allies in the region. Sadat would pay dearly for the leadership he showed during the talks. He was assassinated by Islamic radicals in 1981. An event on the border between spacing and not spacing: none of the effects by themselves are particularly harmful, but the combination of all three is a little bit irritating. The influence is often not worth repairing: Sadat Expels Soviets will likely undo all the work you’ve done in Egypt. 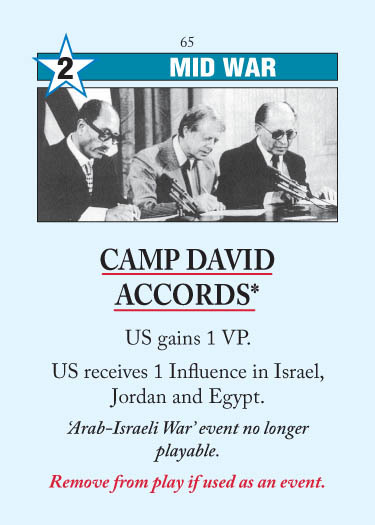 But Camp David Accords gives the US halfway to control, and Sadat takes them the rest of the way. A nice event, and one I try to trigger. It is especially nice when you have no influence in Egypt, since then Sadat Expels Soviets will give you Egypt instead of just putting it to 1/0. Cancelling Arab-Israeli War is a small bonus, and 1 VP is 1 VP. This entry was posted in Mid War, US Events and tagged camp david accords. Bookmark the permalink. I always feel that Nasser should be unplayable after Sadat. Yeah, fair enough. I agree it makes the gameplay more interesting. Can not decide already with a couple of cards.. If US gets to place 1 influence in Jordan when Jordan is already having a control of USSR, does 1 influence got placed anyways? Yes. Cards that say “place influence” ignore the 2-for-1 control rule and the adjacency rule.